The weather is getting warmer and that means more time outdoors having barbecues and camping. Blue Rhino is in front of every store and you exchange your propane tank for another one but you know they have more than just that they have tons of things you need for grilling including Hershey’s S’mores Caddy this cute little box has a carrying handle along with holding Hershey’s chocolate bars, graham crackers and marshmallows for S’mores, and has a removable tray to easily put everything in here. My Opinion: I really like how easy it is to carry but the handle along with everything you need for s’mores so them graham crackers won’t be crushed or anything else be squished; it also reminds me of a tackle box for fishing. 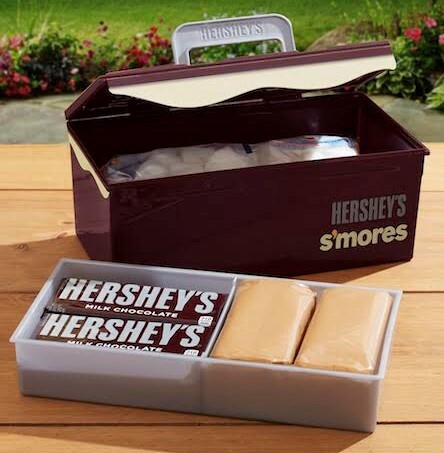 This is a great idea for taking camping, picnics, tailgating or storing any ingredients in to be ready for your next adventure. Where to buy? You can find this at Lowe’s or Target with an MSRP of $$17.99.